For all of our latest stationery images, follow us on Pinterest …. … avoid these pitfalls and everything will be fine. Perfectly formed packages of contemporary wedding invitations have been flowing out of the studio door here at Millbank and Kent for 10 years now. In that time we have rescued a few fraught brides who have been let down by their wedding stationer. Don’t leave your invitations to the last minute. Your guests will have their own plans and the sooner you get your big day in your guests diaries the better. You don’t want to find out that your best friend has booked a holiday to the Maldives the weekend of your wedding. Send the invitations out at least 12 weeks prior to the wedding. Once you have set a date we recommend you send out a “Save the Date” card. This can be done before you have all the details finalised for the ceremony and the reception. Whilst you can see the design on-line that is only half the story. The production and card quality are as much a part of the invitation as the design. Always get your hands on a representative sample of the wedding invitation so you can feel the card, how thick it is and the finish of the paper an print. You can also see how well it is creased and folded. Millbank and Kent will send out a free sample of any of our invitations. Unless your screen is pantone colour calibrated it is unlikely your stationery colours will come out exactly as you see them on your screen. If you are looking to colour match your stationery with other parts of your big day then ask for physical colour swatches from your stationer so you can match them to your scheme. At Millbank and Kent we often have brides send us a swatch of cloth from a bridesmaids dress or a cutting from a magazine that we colour match to. All of our colour matching is free of charge. 4. Do not over order!!! If you combine this sin with #2 you can really waste a lot of money if you are not careful. Make sure your stationer understands who has the authority for final approval of the printing of your stationery. More than once we have been instructed to print stationery by an over enthusiastic family member… only to double check with the bride who on some occasions isn’t quite final on some details. Millbank and Kent will want you to confirm all is ok to print before it is printed. Make sure all those involved with the wedding see the wording of your stationery. Given that there will be a number of people involved, request your stationer provides an on-line proof. This will allow you to email the link to the person hosting your ceremony, the venue organiser and key family and friends. It is always good to get lots of people to review to check for any possible errors, post code errors are quite common and easy to overlook. The arrival of your wedding stationery is an exciting milestone in the run up to the wedding. When your stationery arrives open up the package and check the contents are exactly what you require. When sending them out be careful not to muddle the invitations if you have different invitations for day and evening guests. Also be sure to insert the correct information cards and RSVP cards with each invitations. There is nothing worse than sending an evening invitation to someone who you intended to send a day invitation to. At Millbank and Kent we package each different item in separate bundles to help avoid any confusion. We also offer the option to have all your guest names individually printed in each invitation. 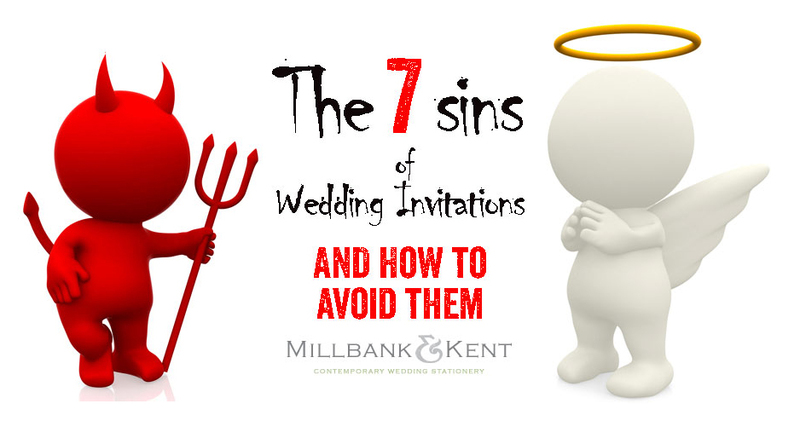 We hope by highlighting the possible pitfalls we have aided the smooth ordering and sending of your wedding invitations and stationery. If you have any questions or would like to receive a free sample wedding invitation please contact us here at Millbank and Ken and we would be happy to help.